Long-time readers and friends likely know of my obsession with the show Traces, which I first fell in love with in the Fall of 2008 when it toured through Charlotte. Since then, I’ve continued to marvel at the amazing work of the production company, 7 Doigts (Seven Fingers), even up to a few weeks ago with the phenomenal Cirque du Soleil: Paramour in New York. But none of their previous work prepared me for Cuisine and Confessions. It isn’t hyperbole when I call the show stunning. Absolutely stunning. DO NOT miss this show. Traces wowed me with its remarkable acrobatics, its innovative choreography, and its clever wit… And yes, the delightful chemistry between the cast and even the audience. Cuisine and Confessions has all of that, to be sure (though the Traces scene with the recliner and the book will always have a special place in my heart). But the unique power of Cuisine and Confessions is in the series of stories told in and around the movements. 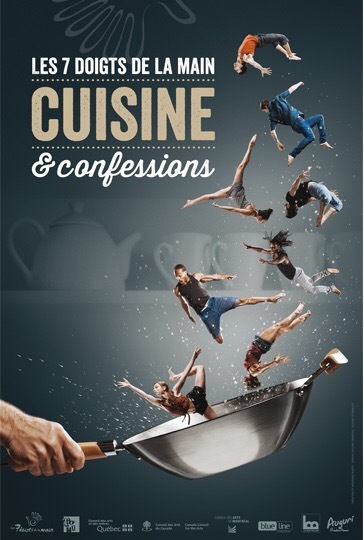 Cuisine and Confessions takes us through its performers’ memories of how food has shaped their lives. We learn about one performer taking refuge from a rough neighborhood in the food from his family kitchen. Another tells the story, in Spanish, of how his family would always come together every Sunday over a meal. A third talks about growing up in the shadow of his father’s absence, having lost him as an infant, wondering what his dad’s last meal was. The dance and acrobatics were literally breathtaking. The music was captivating and beautiful, and wove in personal tales from the troupe. The interactions with the audience were charming and cleverly orchestrated. But this show brings such depth, such heart, to its performance, that it’s unforgettable. Ten minutes in, I leaned over and told my husband that I wanted to come back the next night. This entry was posted on Saturday, July 30th, 2016 at 8:20 am and is filed under Uncategorized. You can follow any responses to this entry through the RSS 2.0 feed. You can skip to the end and leave a response. Pinging is currently not allowed.